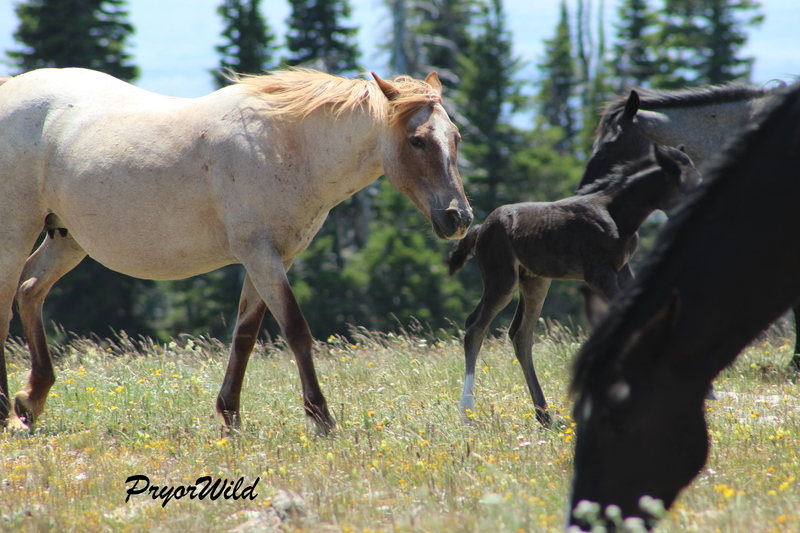 What a pleasure it has been to spend a little time with the newest Pryor foal Pegasus! She is the daughter of Ireland/Electra and Galaxy. Her name was chosen by Sandy Palen who was the first to report her to us. Pegasus is a constellation in the northern sky named after the winged horse, Pegasus. 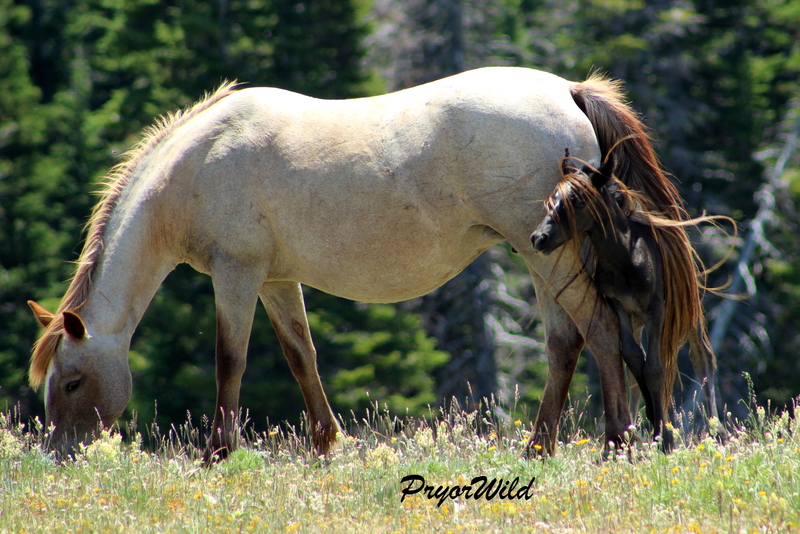 One day soon, Pegasus will run as if she has wings, but for now she is content to just stick close to her mom, Ireland. In fact, right now she is a perfect fit right under her mom’s belly. Today big sister Limerick kept herself in a protective place to help keep the foal safe. Limerick and Pegasus both share a unique face mark similar to their mother. The rest of the band sticks close to their newest member. 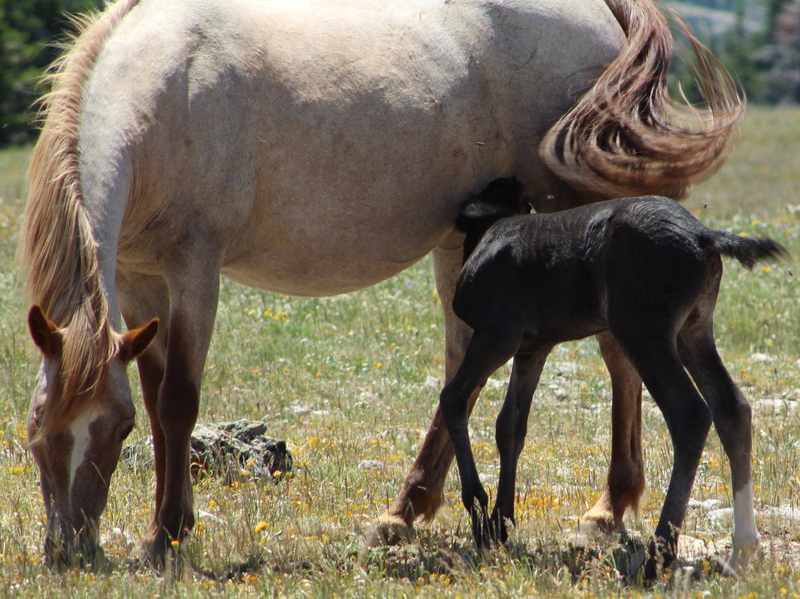 The foal spends much of her time eating. Ireland continues her grazing to help keep a good milk supply for her baby. 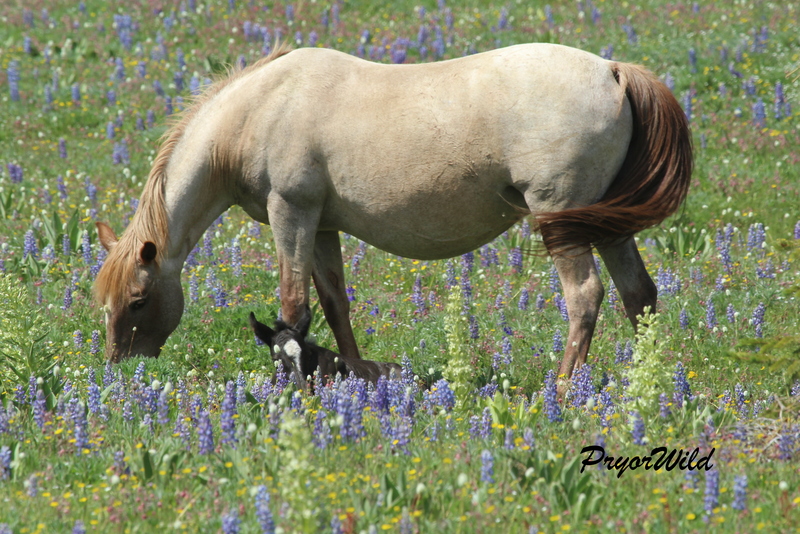 And the foal spends a lot of time sleeping in her nice soft bed of lupine. 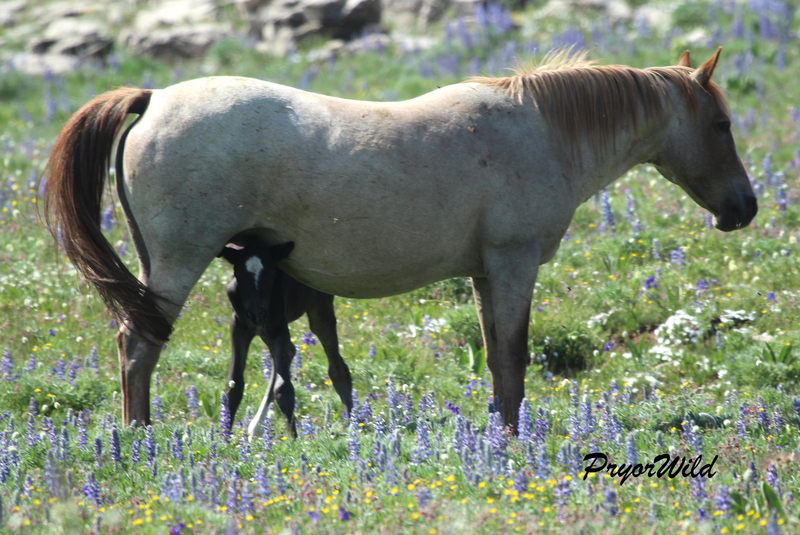 The insects are pretty annoying in the summer heat, a mother’s tail does wonder to help keep the bugs off a foal. Ireland takes the time for a tender moment with her newest foal. At the age of 18, she has had plenty of practice raising her young. Our records show that Pegasus is Ireland’s 12th foal. Of those, four others remain on the Range today including Celt, Irial, Gaelic Princess, and Limerick. 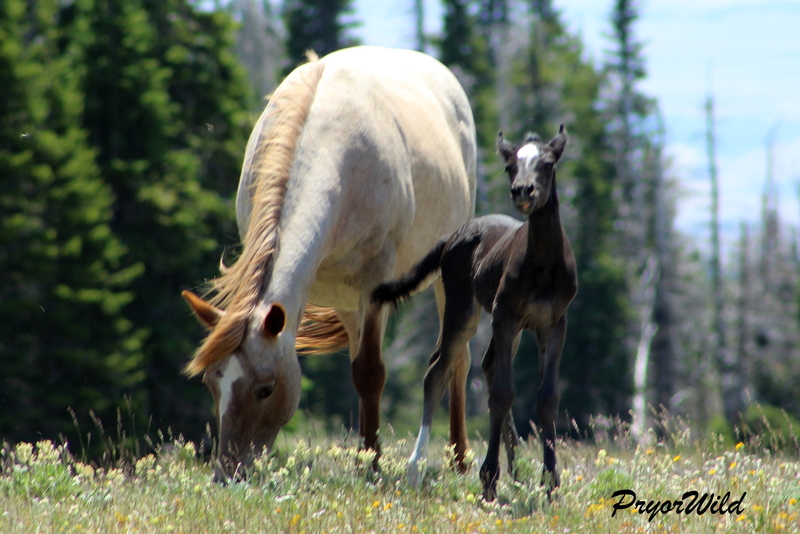 Welcome Pegasus to your home in the Pryor Mountains. 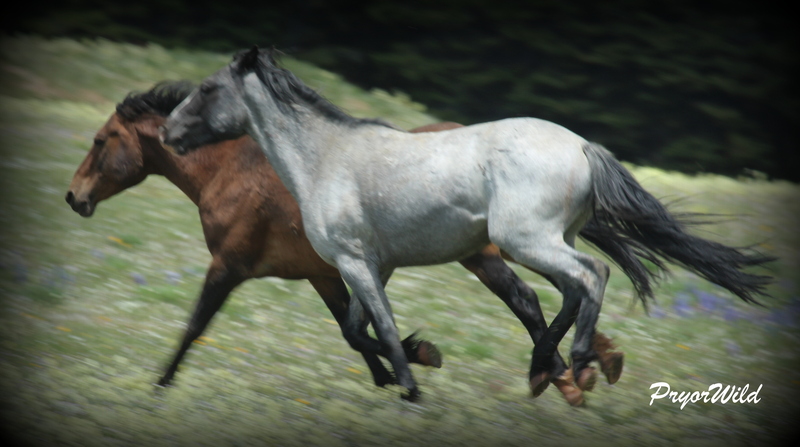 There is nothing like the sight of wild horses running! 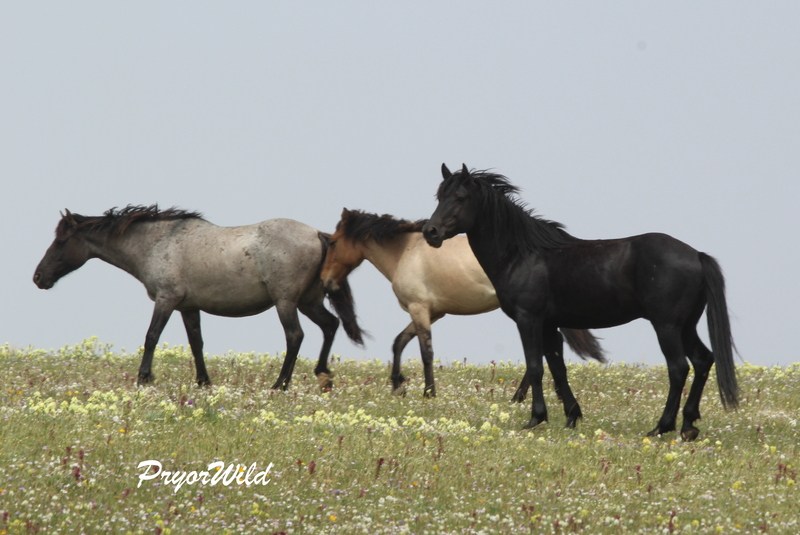 Steve took this beautiful video of the Pryor Horses on June 23, 2015. 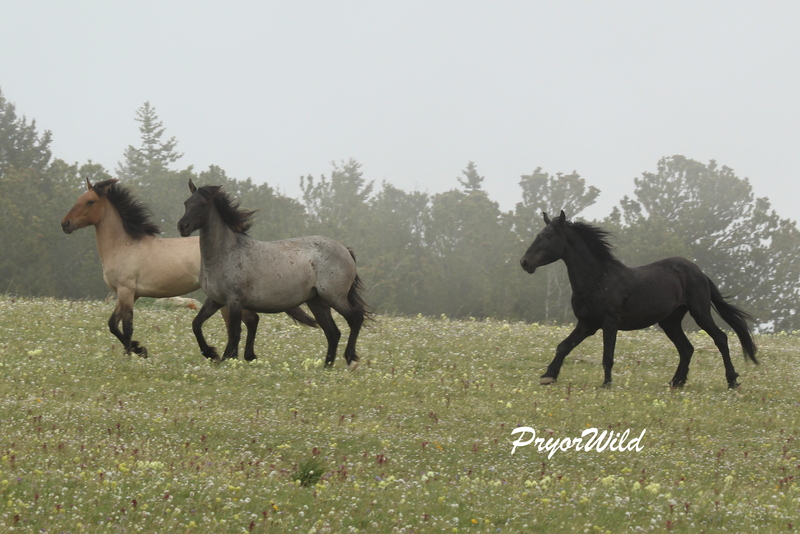 For some reason, the horses took off running across the upper meadows. Watch and listen to the sounds of these magnificent animals! On Sunday, June 14, 2015, the mountain was draped with a heavy blanket of clouds. 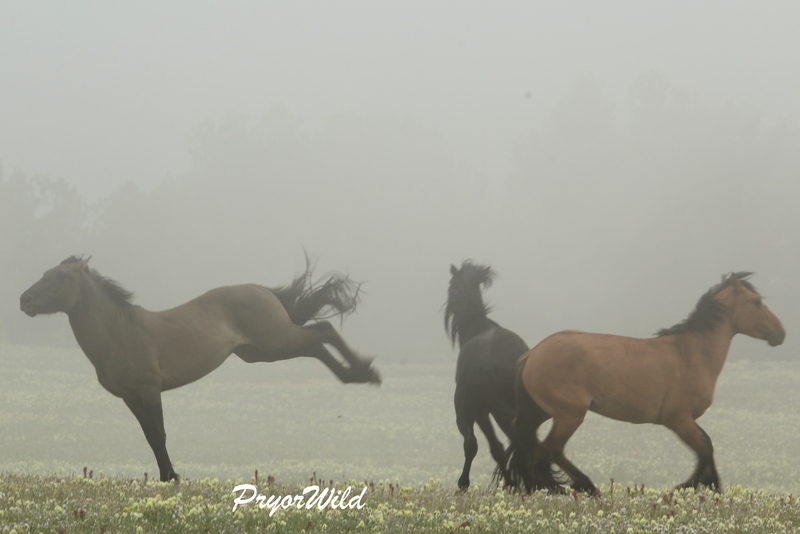 The horses were like ghostly images in the foggy skies. 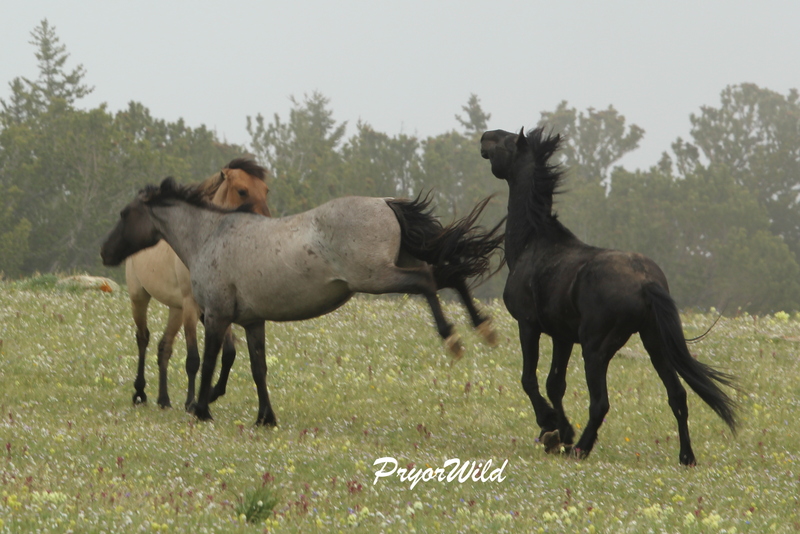 As the clouds began to lift, the horses became more and more active. As the cloud lifted, so did their energy levels. Three bachelors engaged in some good-natured fun. It was Moorcroft and McKeahnie, both age three. The third was a black. 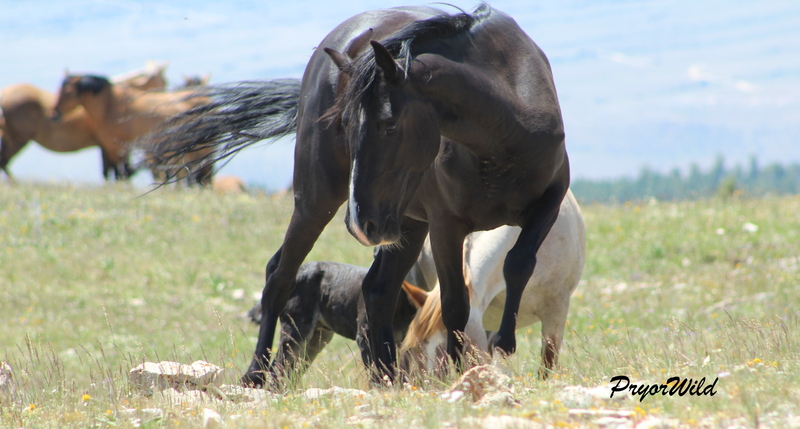 The black stallions can be a bit tricky to identify, especially those that don’t have the easily recognized white marks. 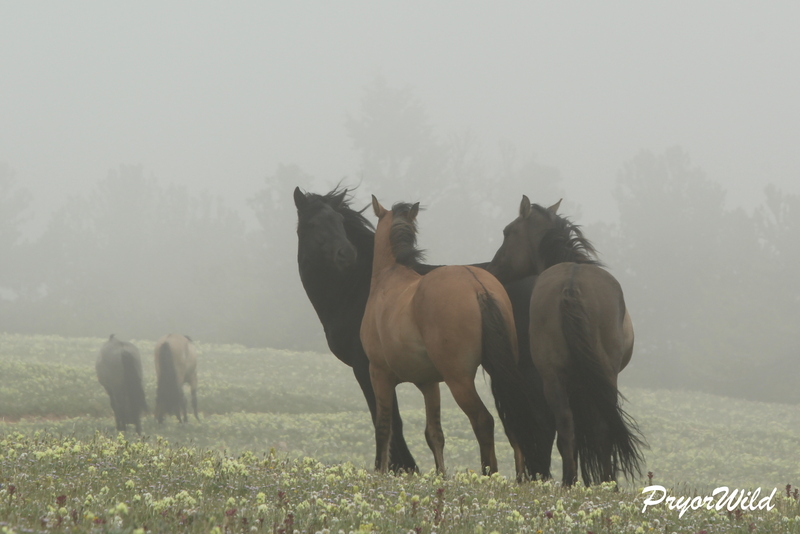 Three bachelors in the mountain mist. The two horses in the background led to the conclusion that this was Hamlet. It was Audobon and her two-year old daughter, Niyaha. They have been with Hamlet since last summer. The boys continued to play. At one point, Moorcroft took aim with both hind feet! Moorcroft with a “double-barrel” kick. 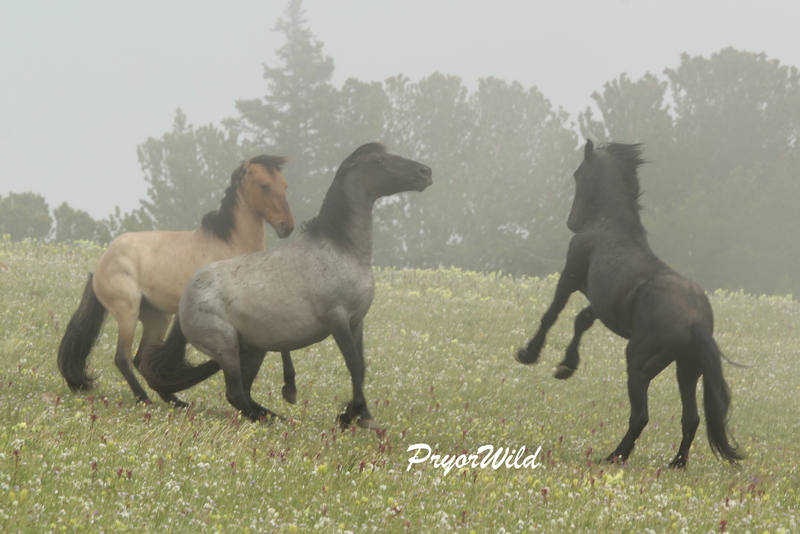 As the boys played…Audobon and Niyaha’s grazing moved them down the hill and out of site. Coronado/Red Raven, had been in the vicinity and took the opportunity to get himself a band. 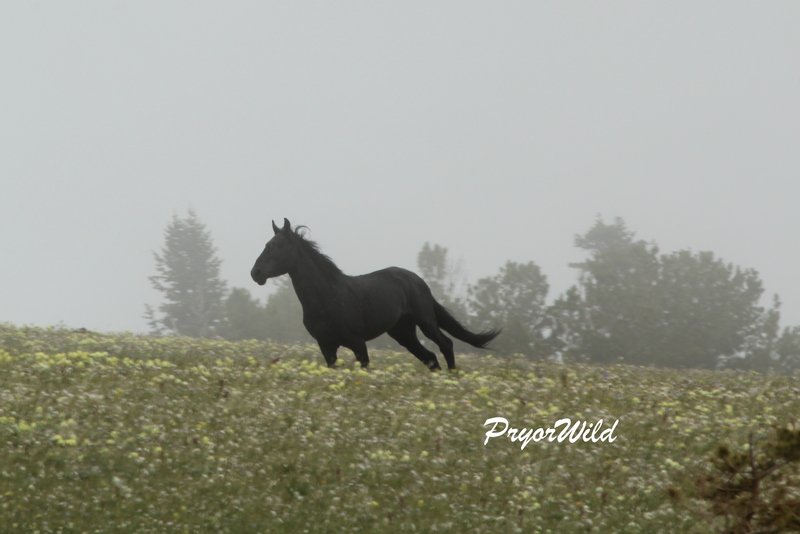 He followed Audobon and Niyaha across the foggy meadow. Conoado has been a bachelor since last summer. He seemed to know just the right moment to claim a band. 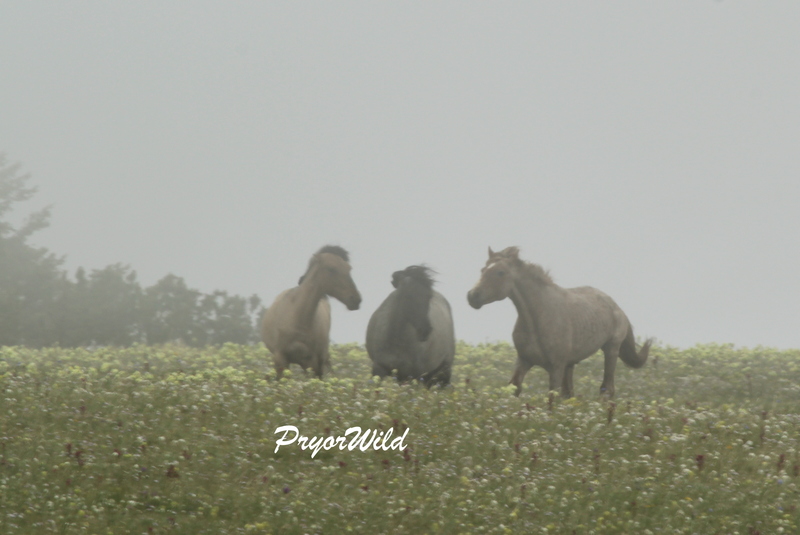 He circled around the mare and the filly. Coronado greets Niyaha and Audobon. But wait! 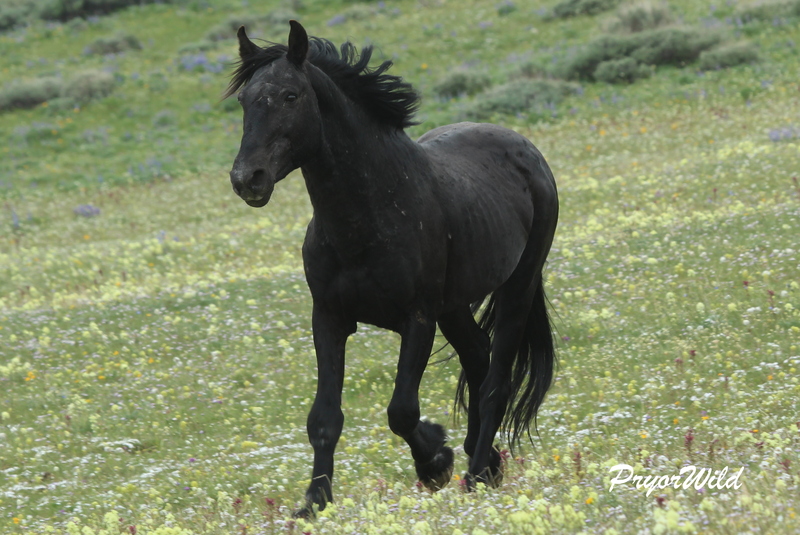 A black stallion came charging out from the trees to the east. Who was this? Was it really Hamlet up with the boys or was this Hamlet? Regardless, Coronado had no desire to fight for the girls. Whoever it was, the girls were not happy. This next series of photos shows some pretty serious action! 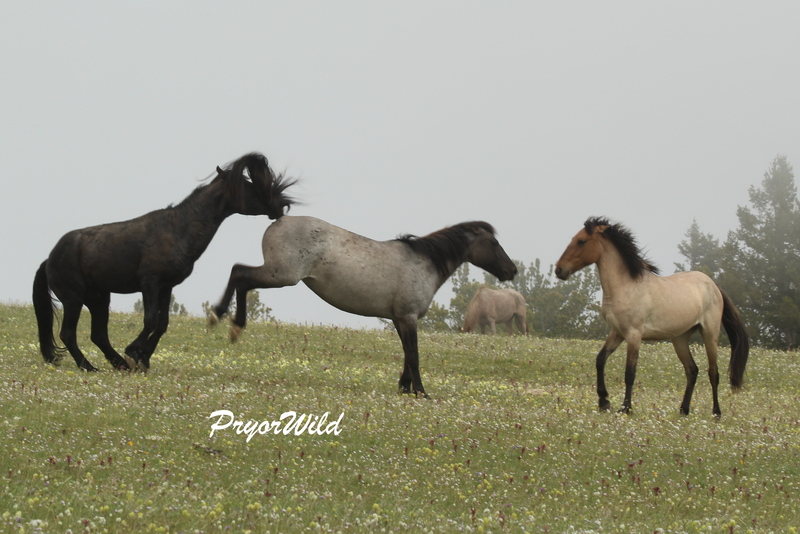 First the mare and filly turned and ran. The black was in pursuit. Audobon placed herself between the stallion and her daughter. And then she fired! The black rears up in response. The black retaliates with the same tactic. 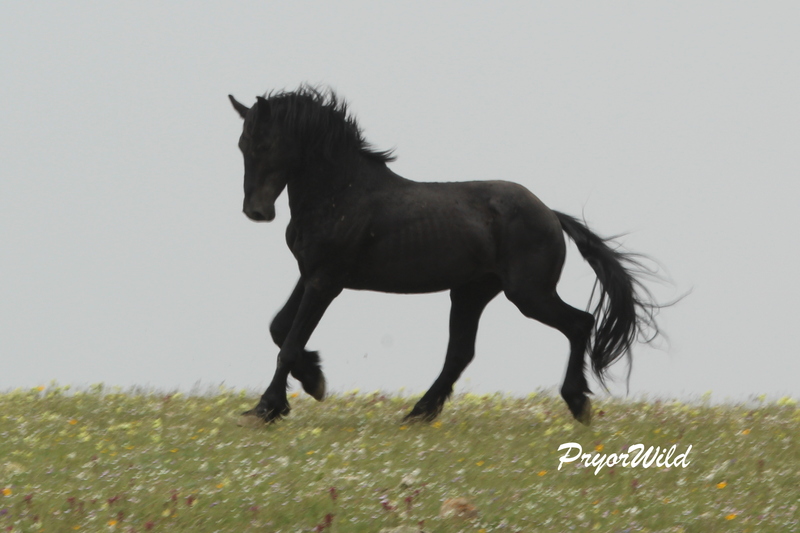 A short time later, a black comes running from the west to check out the action. 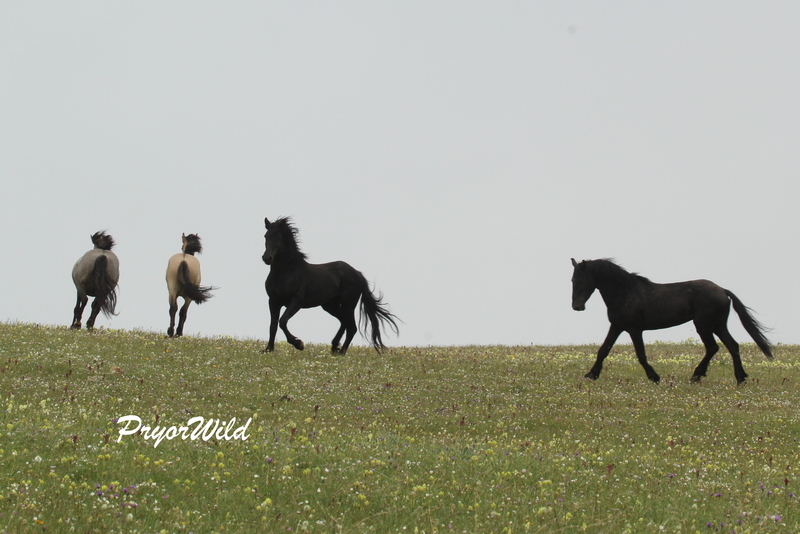 The other black leaves the mare and filly and runs out to meet the second black. Another black trots over to the action from the west. The other black runs from the east. 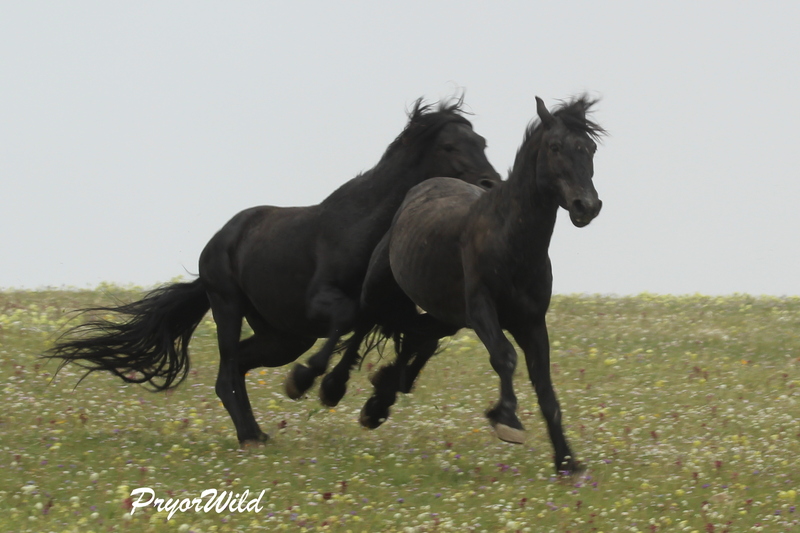 The mare and filly head off as the two blacks posture towards each other. The battle was short lived…more like a chase. The black retreated…no band for him right now. His identity was still a mystery at this point. Hamlet was the one up playing with the boys. 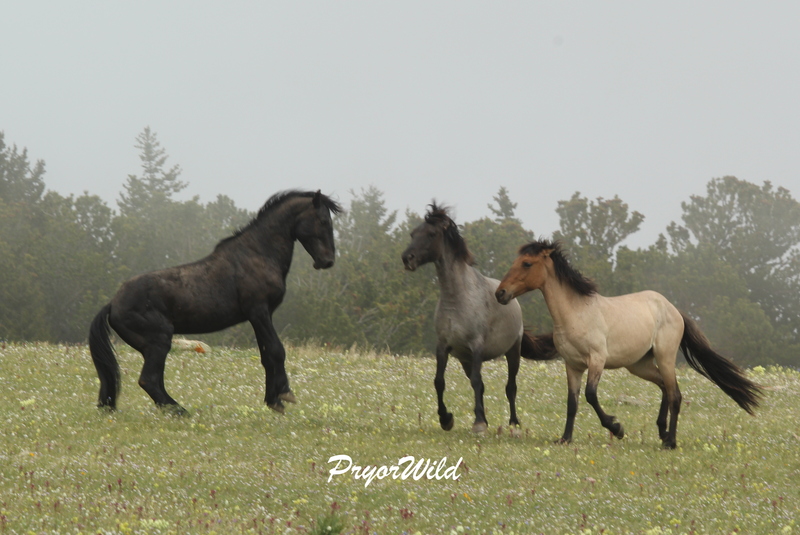 The mare and filly definitely settled back down after their encounter with the other black stallion. Hamlet went on alert. 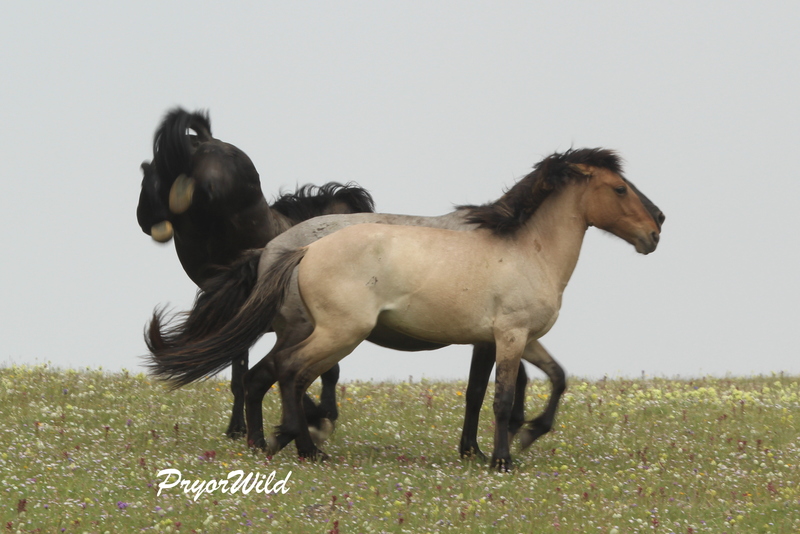 Audobon and Niyaha went back to their grazing. Life for them was back to normal. And how about the other black. 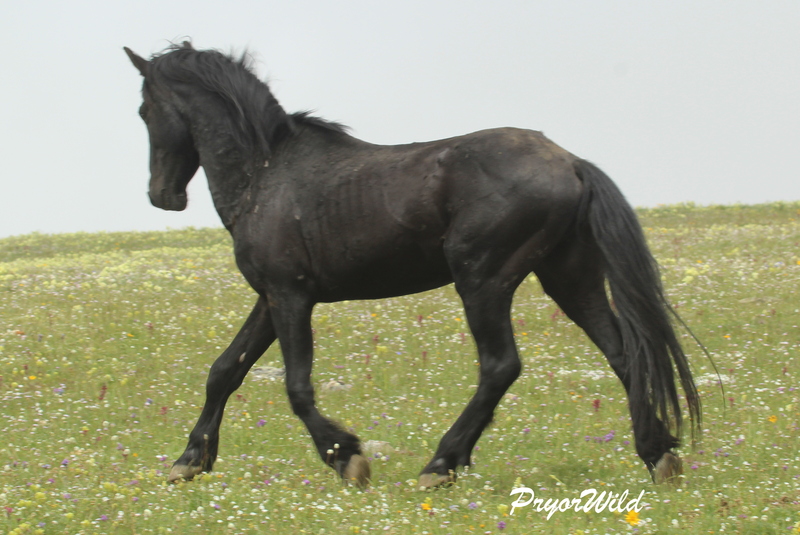 There are two solid black stallions in the Pryors. One is Seattle and the other is his son, Issaquah. Both have been quite elusive for over a year. 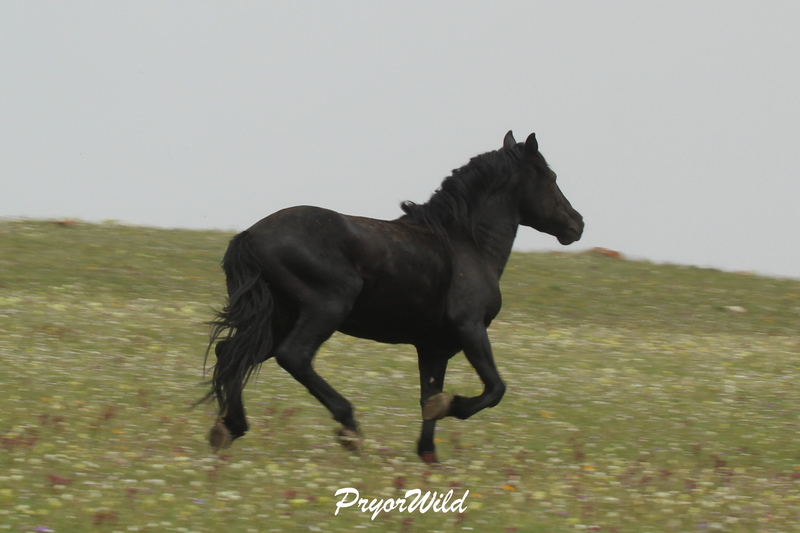 Later on the mystery black came running back towards us. Back home, Kassi had the most recent photos of both Seattle and Issaquah. Using her photos, it wasn’t hard at all to identify him as Seattle! This was very exciting and surprising! Seattle is among the fine group of aging stallions who have lost their bands to the next generation. He was a powerhouse on the Dryhead for many years, and rarely seen on top of the mountain. We did get a report of him from Ginger Kathrens about a month ago. 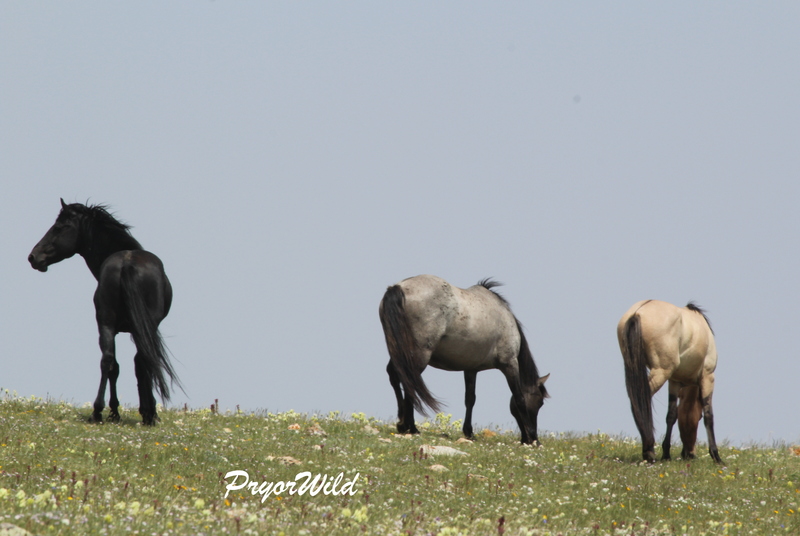 But seeing him on the upper elevation meadows was totally unexpected. 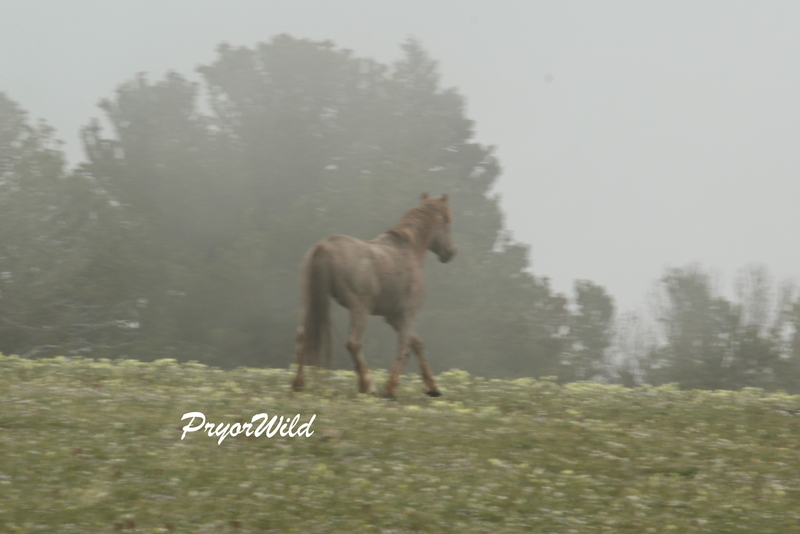 The misty day on the mountain that started out so quietly turned out to be filled with action, a bit of mystery, and the siting of one of the Dryhead legends.